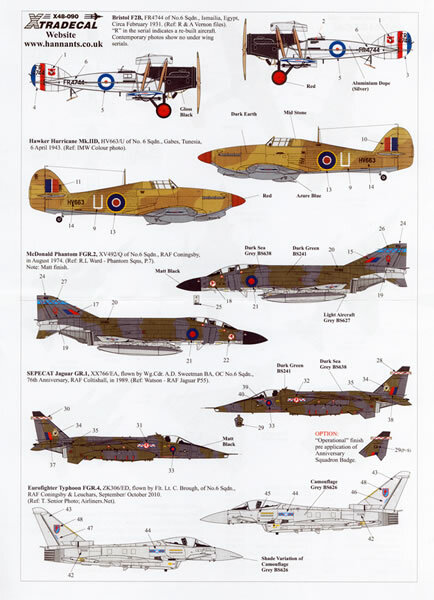 Decals for five subjects with colour-printed painting and markings guide. Excellent production quality and attractive subject choices. Bristol F2B FR4744 at Ismailia, Egypt in 1931. Finished in aluminium dope with black engine cowling and forward fuselage as well as red wheel covers. Hawker Hurricane Mk. IID HV663 at Gabes, Tunesia in the April of 1943. In standard desert finish of middle stone and dark earth of azure blue with a red spinner. McDonald Douglas FGR.2 Phantom XV492 RAF Coningsby in August, 1974. In the flat dark sea grey and dark green over light aircraft grey camouflage scheme. SEPECAT Jaguar GR.1 XX766 flown by then Squadron’s Officer Commanding, Wing Commander B.A. Sweetman at RAF Coltishall during the Squadron’s 76th Anniversary celebrations in 1989. In the dark sea grey and dark green over light aircraft grey camouflage scheme. Eurofighter Typhoon FGR.4 ZK306 flown by Flight Lieutenant C. Brough from RAF Coningsby and RAF Leuchars in September/October of 2010. Finished in overall camouflage grey finish. The decals themselves have been printed by Microscale. There is a slight register issue with the printing of the squadron badge for the Jaguar option but the rest of the designs are in perfect register (simply leave the squadron badge off and you can depict the option in its normal “operational finish”). The colours look to be correct too with the pre and post war reds of the national insignia being the brighter red whilst the World War Two ones have been printed in the duller red. With regard to national insignia, you are provided with a separate set for each option. No stencil data is provided and a note on the placement guide advises you to “use kit decals as appropriate”. The placement guide is in the form of an A-4 sized sheet that provides colour left and right hand side profiles as well as upper and lower plan view drawings of each option. Also included is a list of the colours you will require in the Xtracolour enamel and acrylic ranges. Packaging is via a paper envelope with a clear “window”. This is another very nice sheet from Xtradecal. 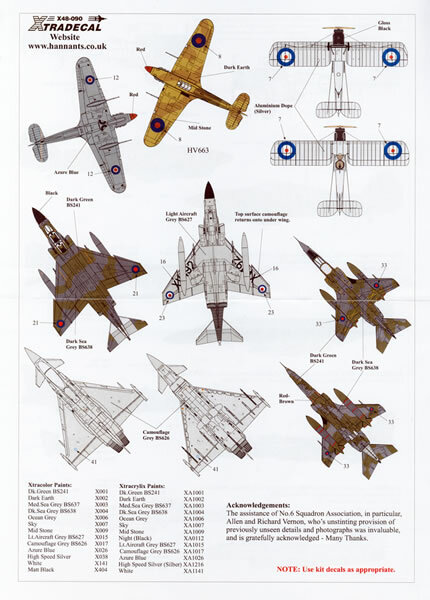 It provides you with excellent quality markings for a range of machines operated by 6 Squadron in pre-war, World War Two, Cold War and modern day markings. 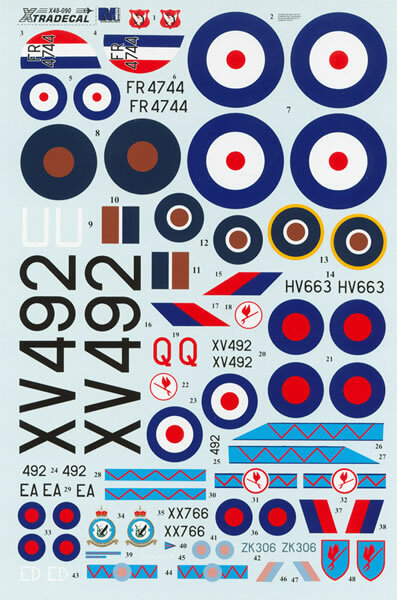 The same markings are also available in 1/72 scale on the Xtradecal 72127 sheet. Thanks to Hannants for this sample.